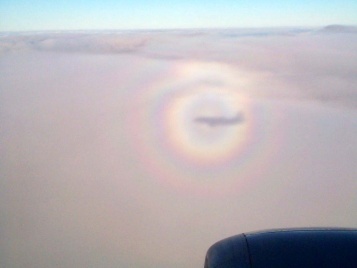 When you travel by air, look out for the shadow of your aircraft on the clouds. If you are lucky, you will see a glory around the aircraft's shadow - as shown in Fig. 1. Before air travel became common, glories were rarely seen. 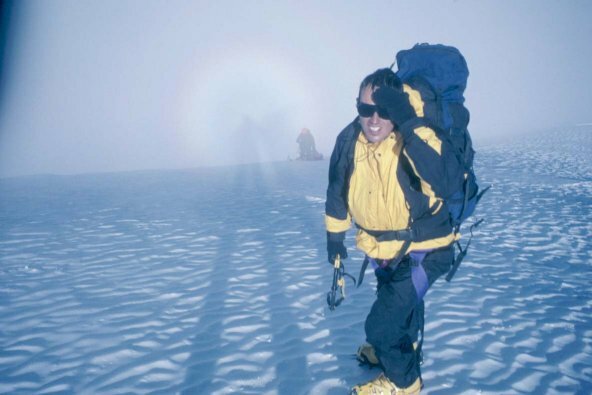 Those climbing to the top of hills occasionally reported seeing coloured rings surrounding the shadow of their heads on clouds or fog below them. 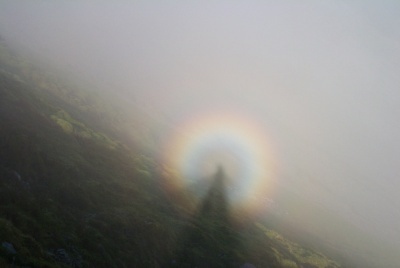 The term "Brocken Spectre" is commonly used because, historically, there were many sightings from Brocken in the Harz mountains of Northern Germany and because the elongated shadows of people resemble a ghost or "spectre". Fig. 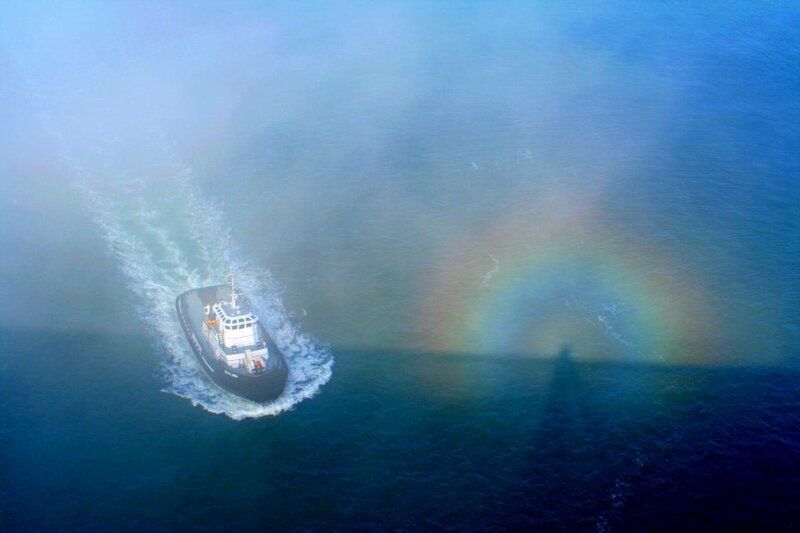 2 shows a stunning example of a Brocken Spectre as seen by Dave Newton. If you see such an effect from a hill or mountain, you may be perplexed by the fact that the coloured rings appear only around the shadow of your own head - and not around the shadows of your companions. This effect is clearly shown in Fig. 3 below, where the coloured rings of the glory are centered on the shadow of the photographer's head, whilst the shadow of Pedro Gonzalez is not "blessed" by such rings. Of course, your companions see rings around their own shadows - but not around yours! Even more strangely, if you take a picture with a camera at the end of your outstretched arm, the picture will show rings around the shadow of the camera. Fig. 3 Pedro Gonzalez (right) and a Brocken spectre seen very close to the summit (22,600 ft) of Aconcagua in Argentina. Fig. 4 shows a beautiful glory observed by Mila Zinkova whilst standing on San Francisco's Golden Gate Bridge. In this case, the glory appears on the swirling fog above the cold water. The prevalence of fog near the Golden Gate Bridge means that glories can be frequently observed in this area. Fig. 4 Glory seen from the Golden Gate Bridge. In a more superstitious era, it is easy to understand why people might interpret these coloured rings as a sign that they were "special" or, even, that they had been anointed by God. Perhaps, the idea that saints have halos around their heads originated from reports of glories. Many classical paintings show halos as vertical discs centred on the eyes of saints. Fig. 5 may be the first image of a glory observed from space. It was recorded on 28 January 2003 by the MEIDEX (Mediterranean Israeli Dust Experiment) instrument on board the space shuttle Columbia - which tragically burnt up on re-entry into the Earth's atmosphere on 1 February 2003 resulting in the deaths of all 7 members of the crew. The MEIDEX Science Team at Tel Aviv University found this fascinating image whilst examining the results of MEIDEX and suggests that the term "Astronaut's glory" should be used "in honor of our friends from the Columbia crew". More details are available in a paper published in Bulletin of the American Meteorological Society. Note that the inner red ring of the glory subtends an angle of roughly 1.5° - indicating that the clouds were composed of water droplets with radius of about 16 µm. 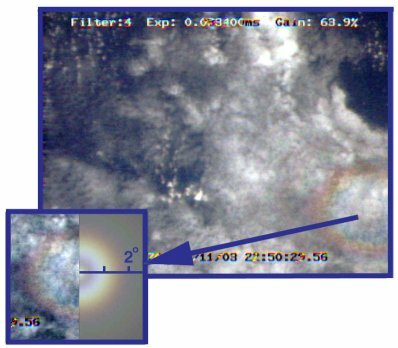 As the slant distance from space shuttle to the anti-solar point on the cloud layer was about 310 km, the red ring has a diameter (on the clouds) of approximately 16 km.